Cpl Zachary Nelson enlisted in the Marine Corps immediately after high school, and deployed as a motor transport specialist with the 6th Regimental Combat Team in December 2011. On July 5, 2012, just two days before his twenty-first birthday, Cpl Nelson was severely injured in a vehicle rollover on a mission to Camp Delaram in Helmand Province, Afghanistan. Stationed as gunner on top of the vehicle, Cpl Nelson was crushed in the accident and could not move his legs; other members of Regimental Combat Team 6 sustained serious injuries as well. The last thing Cpl Nelson recalls after the accident is his best friend kneeling next to him keeping him calm before he was loaded on the MEDEVAC chopper. Upon his medical evacuation to Kandahar, Cpl Nelson learned that he had sustained a T-4 complete spinal injury, rendering him paralyzed from the chest down. After undergoing a 13 hour surgery to stabilize his spine and months of aggressive physical and occupational therapies at Walter Reed and James Haley VA in Tampa, Zachary continues to focus on his recovery in Indiana. He married his wife Kiley in November 2014. In his spare time, Zachary enjoys football and basketball; he’s also a car and truck enthusiast. 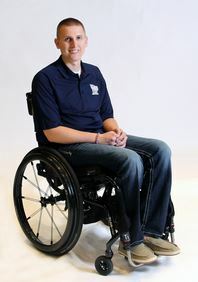 Receiving a specially adapted home from Homes For Our Troops, Zachary says, eliminated many of the obstacles he faced on a daily basis. He is now able to perform routine tasks, like carrying groceries on his wheelchair from the garage without struggling over thresholds in doorways. In his previous home, he had difficulty reaching and bending for items, so features such as pull-down cabinets and a roll-under sinks are a huge help to completing his everyday activities. Zachary is planning to get a degree in construction management and Kiley is a full-time nurse. Zachary and Kiley became proud parents to their first child, Camden, in February 2019. Zach says his HFOT home has given him so much freedom, which has increased his self-confidence and encouraged him to do more. He has returned to work full time as a 911 dispatcher for the county his lives in. Zachary recently walked by using a Robotic Exoskeleton. Although his paralysis condition has not improved, he can lift his feet and take steps using the Exoskeleton.